It rained today. Rained like it should have rained a long time ago. What? That doesn't even make sense. Cheyenne went with me today to Mingus Springs Charter School where I (well Jackson) was turned down for admission. That was before I name dropped. "Oh, well my mother in law who is on the school board mentioned she thought there was space here." "Who is your mother-in-law". "Jolyne Nickle." "Oh well Dawn will give you a call on Monday morning to let you know if that has changed.". I'm hoping for a call on Monday morning with some "changes". Then we went to Davids school where I had to run into a building to drop off a copy of our tax return. Well that wouldn't be a problem normally but it was pourrrrrring rain. The kind that soaks everything. So I ran into the fancy financial aid building where there were several people. Staring. At me. Thinking I was crazy for being there. Remember how David goes to a fancy school? Yeah. Those people were wearing suits. Waiting for the rain to stop before they went out. And here I came in. I kind of loved it. It's refreshing to get soaked from rain. So then the lady at financial aid tells me that she definitely doesn't need a copy of our tax return but some other fancy thing I have to order from the irs.gov website. And that David needs to fill out this specific form and return it to her. I had previously told her that David was in China and then I said, "Well what if I was lying before and David is actually in the car?" And she was funny and understood what I was saying and in case you don't, I was asking her if I could forge his signature and bring it back later. She said yes. lol. We went back home and Jackson really wanted to play in the mud. So he got to. 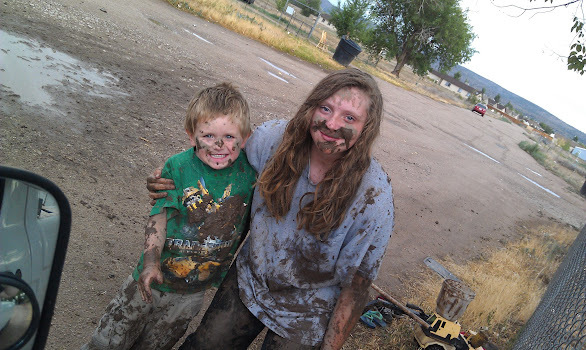 He said, "Mom, the mud feels so good on my feet." It was totally cute. Trish and I cleaned out the garage a bit. But then we got tired and came inside to eat. Now I am here. I ate two dinners tonight. It was awesome. I love my neighbors. And you!